I grew up in the 1980’s, yes I’m that old. One of my favourite cartoons as a child was Scooby-Doo. I loved the characters and even though it was always something crazy going on, it was great fun to watch. Sometimes a little scary at time, but always come right in the end. I even liked the Scooby-Doo film when it came out, well it might have a little something to do with a slight crush on Freddie Prinze-Jnr. Yes I admit it. My boys aren’t as big Scooby-Doo fans yet, but I think they would be if they watched it live on stage. What do you think? Scooby, Shaggy, Velma, Fred and Daphne; the whole gang come together live and stage. And no annoying Scrappy-Doo in sight. What you liked him? 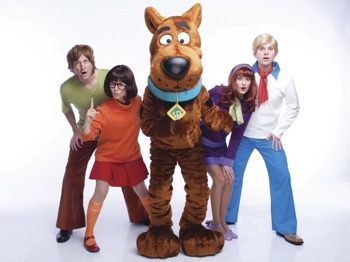 They will be live on stage in The Mystery of the Pyramid: Scooby-Doo Live on Stage. The Scooby-Doo live show runs until the 31st of August and is touring up and down the country so be sure to see if it’s coming to a theatre near you. If you want to check out Scoob and the gang in live on stage foiling the plans of some crook, then why not make a weekend out of it. I think that’s what we are going to do. The kids have broken up for school holidays and a weekend away to see this would be excellent I think. We’ve been looking at Basingstoke and at these places below, what do you think? They are certainly close by and we could have a look at some other attractions in the area to go to. Do you have any suggestions? I think the show looks excellent, the theme tune is as catchy as ever and brought back some fab childhood memories. Have a look at the video below and I can guarantee you’ll be singing along too. Scooby, Scooby-Do……. You can find out more information about the show on the Scooby-doo Live Show website. Disclaimer:- This is an advertorial.